Mary Carlomagno is the owner of Order, which specializes in clutter control, urban apartment solutions, office spaces and shopping addictions. Mary’s philosophy is simple, do not let clutter control your life. Mary has extensive television experience including appearances on The Oprah Winfrey Show, the Today Show, Fox and Friends, Dayside, The God Squad, CBS News and Good Housekeeping TV. She has been interviewed on National Public Radio, the Joan Hamburg Show, Martha Stewart Living and by Leeza Gibbons. Her approach has been featured in Real Simple, Woman’s Day, Quick and Simple, For Me, Newsday and the Daily News. Mary writes frequently on the subject of getting organized for magazines and newspapers including the Washington Post, the Philadelphia Inquirer, Pink Woman’s World, Body and Soul and Figure. Her first book Give it Up! 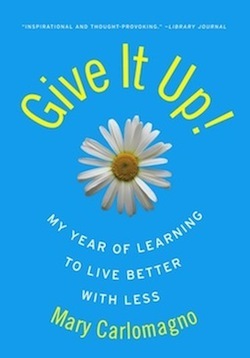 My Year of Learning to Live Better with Less is published by HarperCollins. Her second book, Secrets of Simplicity is published by Chronicle Books. Her third book Live More, Want Less is published by Storey Publishing.